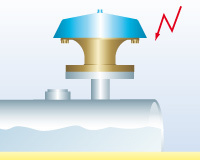 To avoid a flame propagation from outside (atmosphere) to inside of systems e. g. storage tanks, vessels or in process plants a flame arrester at end of vent line has to be installed. End of line deflagration flame arresters protect the impact of atmospheric deflagration and prevent flame transmission to protect equipment. These flame arresters are not tested for short time or endurance burning.